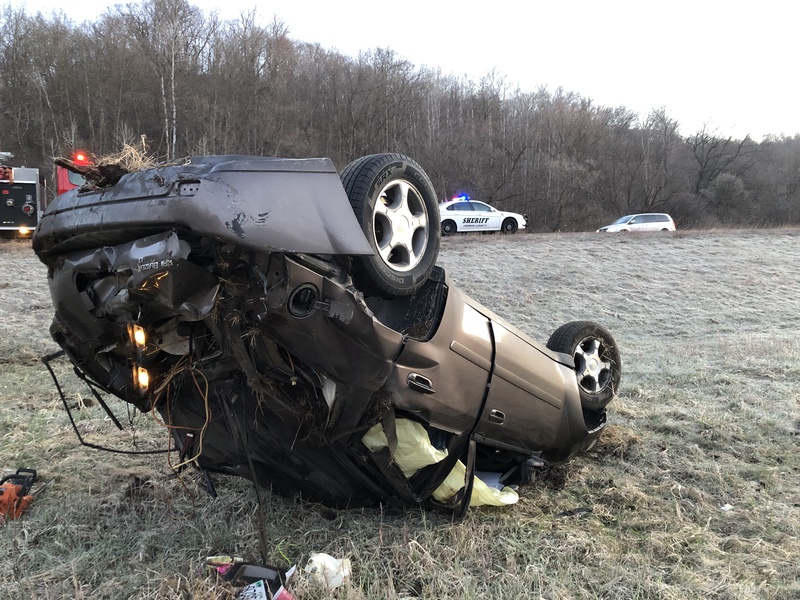 On Monday morning, April 15, 2019, at approximately 5:45 AM a single-vehicle crash occurred on US Highway 14, just east of the village of Readstown, in the town of Kickapoo. Rudolph R. Haugen, age 48, was operating a mid-sized sport utility vehicle eastbound on US Highway 14 and lost consciousness. In a curve to the left, the vehicle left the right, or south side of the highway traveling parallel to the highway. The vehicle traveled several hundred feet, became airborne and traveled over a ditch and concrete box culvert structure. The vehicle landed on the opposite side of the ditch and remained upright until striking a field road driveway entrance. The vehicle became airborne, landed in a field, overturned (flipped from end-to-end). The vehicle came to rest on its top. Rudolph Haugen sustained non-life-threatening injuries and was transported to Vernon Memorial Healthcare in Viroqua by Readstown EMS. He was later transferred to Gundersen Health System in La Crosse where he is listed in stable condition. Assisting the Sheriff’s Office at the scene were the Readstown Fire Department and Readstown EMS. This entry was posted by WRJC WebMaster on April 16, 2019 at 10:27 am, and is filled under State News. Follow any responses to this post through RSS 2.0. Both comments and pings are currently closed.